In loving memory of our mother Ingeborg Schneider, 87, who passed away Saturday, January 12th at Royal Victoria Regional Health Centre, Barrie, Ontario. Mama’s heart was filled with love but it finally needed to rest. Born July 20th, 1931 in Rappach, Germany, she was the oldest child of Karl and Lina Weitzel, she was predeceased by her siblings brother Karl, and sister Brunhild. She married Franz Schneider in 1954 and moved to Canada in 1959 with their 2 children, Elisabeth & Michael. Inge worked as a furrier for most of her adult life creating wonderful garments that were worn in all corners of the globe. 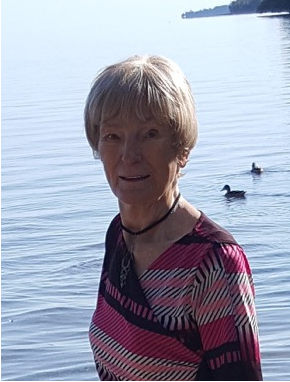 She was a member of the Toronto Hunt Club and enjoyed riding her horses well into her 60’s, she was a proud member of the Barrie Art Club in her 70’s and 80’s, and was able to fully express her artistic abilities. She found her soul mate in Reg Bryant, and they shared 17 wonderful years until his passing in 2015. Inge was called Mama and Oma by many people who knew her and she appreciated that as a sign of love. She was lucky to be included as a member of the Bryant and Schmidt families. She leaves behind her daughter Elisabeth Campion and husband Dave, grand daughter Arielle Campion,and great grandchildren Zander and Aquaella Campion all of Ft McMurray, Alberta, grand daughter Eliina Alle-Kopas and husband Todd and great grand children Aidaen, Nevaen and Aija, of B.C. , son Michael Schneider and wife Jen Moffett and grandsons Cole and Eric Schneider of Mississauga. A celebration of life will be held at the Barrie Art Club, 11 King St., Unit 8, Barrie, L4N 6B5 on Sunday, February 17 from 1:00 to 3:00 pm . In lieu of flowers please consider a donation to Plan Canada or the Salvation Army.